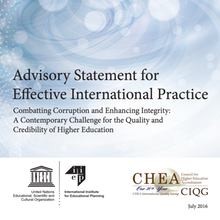 Alarmed by the growing frequency of news reports about academic corruption, an international panel of experts is calling for “action on a broad front” to combat the problem, arguing that dishonest practices are “undermining the quality and credibility of higher education around the world”. And it’s happening “at a time when [higher education’s] importance as a driver of global development has never been higher”, says a report from the 14-member panel. The group has released its advisory statement as a step towards catalysing an international effort to fight the problem. The advisory statement was prepared by Sir John Daniel, a distinguished former president of the Commonwealth of Learning and former UNESCO assistant director-general for education, working with IIEP-UNESCO and CIQG. For the full story read the University World News.